Wingwalking is the rare and thrilling airshow act of moving on and in-between the wings of an aeroplane during flight. Recreating the nostalgia and romantic spirit of the 1920’s, Wingwalker Danielle takes off from within the cockpit of her biplane piloted by husband Emiliano. Once airborne she climbs out in-between its wings, leaving the crowd amazed by this courageous act of daredevilry and skilled showmanship! With over ten years of professional wingwalking experience she manoeuvres across the wings, as the plane loops and rolls through the sky, smiling and waving to the cheering crowd below her, before returning to the cockpit for landing! Glamour, action, noise and (environmentally friendly) smoke with a barnstorming, rip-roaring, jaw dropping 450hp Super Stearman! Aviatrix Sweetheart Danielle Del Buono is 46 Aviation’s Wingwalking Show-woman! Danielle, 28, originally from England dreamed of becoming a Wingwalker from early childhood and she is now in to her 11th year as a professional Wingwalker! She is arguably one of the most experienced in the World, with over 1000 wingwalks under her belt and she is one of the few that does the REAL Wingwalking!! Not just stood on the top wing but actually moving inbetween the wings and really climbing around the plane!! Same way as they did it in the 1920’s! She says it is a huge adrenaline rush and a wonderful feeling to be dancing on the wings of a plane in flight. Even obtaining her private pilots licence and flying 46 Aviations 1939 Bücker Jungmann, Danielle quite simply belongs to the sky. 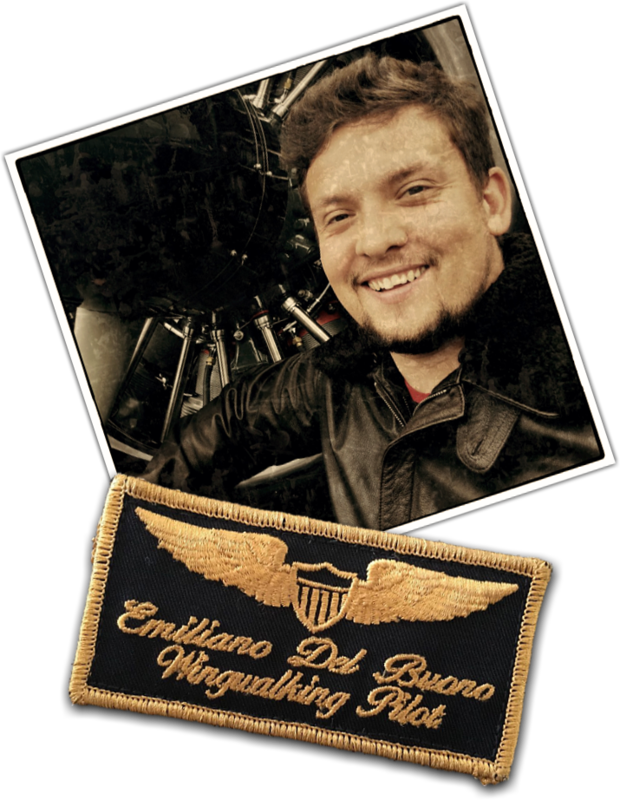 Emiliano Del Buono, 46 Aviation's CEO discovered his love of aviation at a very early age. Aged 17 he gained his private pilots license and began to practise in touring aircraft. Very soon after, he decided to move to something more exciting and discovered the Extra 200. He is now a member of the Swiss Unlimited Aerobatic Team flying his Extra 330SC. He is an airshow pilot, displaying warbirds, wingwalking and aerobatics. Emiliano pilots the Boeing Stearman Aircraft for Wingwalking Danielle, as she climbs around its structure, communicating with her using hand signals. He uses the Stearman as a work-horse to exhibit Danielle's wingwalking expertise and must fly according to the needs of his wingwalkers routine criteria. He has to carefully manage the aircrafts energy and make regular adjustments due to Danielle's movements constantly altering the aircrafts centre of gravity. Emiliano compliments Danielle's show by blending it with his intense, accomplished aerobatic training, looping, rolling and diving through the sky aerial arena! As well as the Stearman he also flys and operates the Yak 9, C-3605, Bucker Jungmann, TB20 and Extra 330SC. He is also managing the restoration of two Messerschmitt BF109s, a P40 and an additional C36. The 1943 Boeing Stearman was first used as a primary training aircraft for American pilots who went on to fly fighters and bombers in World War 2. 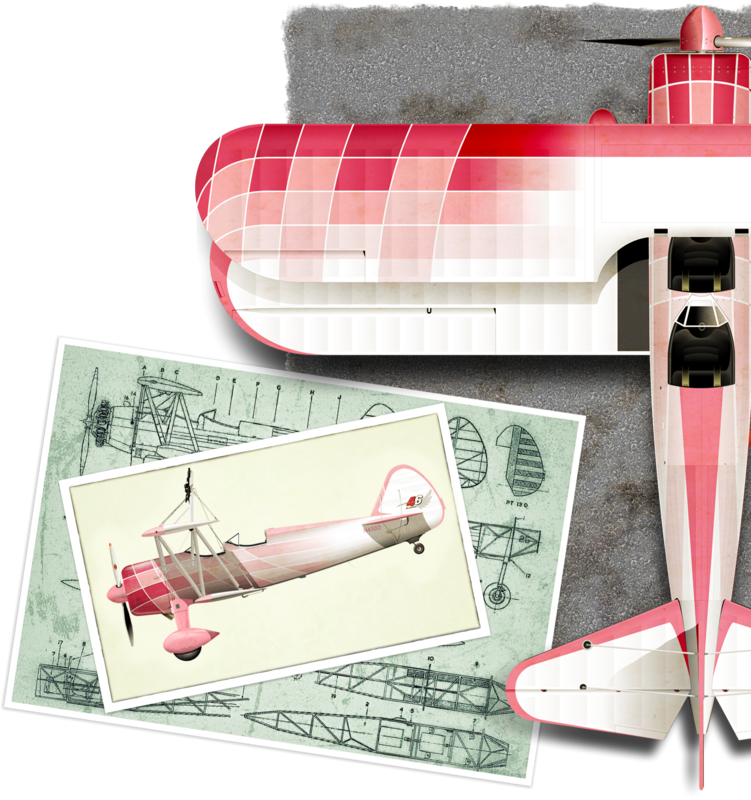 When the war ended, Stearmans came on to the civilian market, often being used for agricultural crop spraying duties. This Stearman has been given a new lease of life in becoming an exciting modified wingwalking airshow plane, allowing Danielle to gracefully move around the aircraft during flight, waving to the crowd below her. The aircraft has a certified wing-rack on the upper wing, which had been designed, tested and approved to the utmost stringent safety regulations, obtaining its legal certification. Although Danielle uses her muscular strength and expertise to navigate herself over the aeroplanes structure, she is still tethered to the aircraft with a waist harness safety line. She wears a FIA approved fireproof uniform, suit and gloves. Standard Stearmans have a 220hp engine, but this one has a super 450hp (Pratt & Whitney Radial) engine to counteract the drag Danielle creates. She may be a small build, but in some ways acts as an air-brake when transferring from the cockpit to wing! It has four ailerons, instead of the standard two, to improve the aircrafts roll rate. Also an inverted fuel and oil system to allow for aerobatics and negative g’s. This plane also has an environmentally friendly smoke system to create pretty patterns in the sky! 46 Aviation is a company based in the Swiss town of Sion, established in 2009 aimed at displaying and operating aircraft machines. 46 Aviation is also managing the restoration of two Messerschmitt BF109s, a P40 and an additional C36. 46 Aviation performs air displays and private demonstrations, but as well as this participates in various sporting events and competitions all around Europe. 46 Aviation also provide touristic flights over the Alps and the beautiful Swiss scenery in some of its impressive aircraft. 46 Aviation Wingwalker Danielles action packed adrenaline pumping performance offers your event glamour, action, noise and (environmentally friendly) smoke, showcasing amazing acts of daredevilry and showmanship! 46 Aviation are based in Sion, Switzerland but travel all around Europe to several events each year. 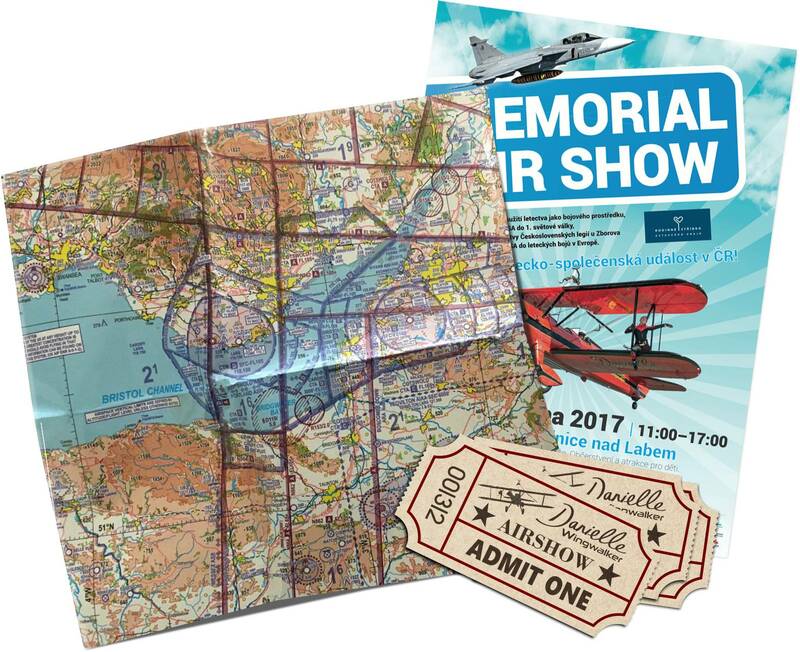 If you are interested in booking the team for your event, whether it's on the organised airshow stage, a public or private event, large or small, you can contact danielle@46aviation.com to discuss how to proceed. 46 Aviation SA can communicate in English, French, German & Italian.